While IMD still defers its forecast, Another Independant Monsoon forecast from my friend Rajan here on his blog. Rajan is a very experienced meteorologist. IMD should have taken up this job in right earnest much earlier. Vagaries had mentioned this earlier here. These reports are my personal views, study and observations. Estimates and forecasts are also my own calculations and views, and may/may not tally with any other estimates. To understand the subsequent articles in this series, I suggest this initial article (MW-1) should be properly understood. The Sub-Continent is eagerly awaiting for its share of 2012 monsoon rains ! This annual series is a follow up and chasing of the South-West Monsoon. Initially, in the firsr few articles, this series will be chasing and closely following up the actual developments of the monsoon, and analysing its progress for calculating and estimating the arrival date. This is very important, as year to year, variations in dates of onset of the monsoon can occur and there have been several occasions in the past when the monsoon arrived over certain parts of the country about a fortnight earlier or later than the normal dates. 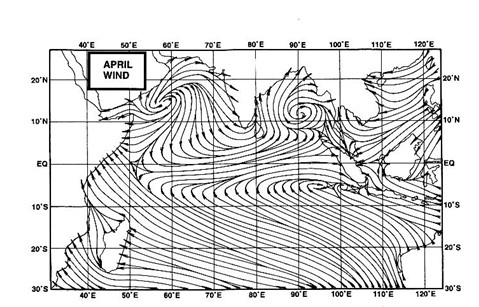 The SWM has the weatherman tearing at his hair for the exact date or time, extent and progress. This is never 100 per cent sure though various weather models are used to calculate this event. We are not yet contemplating the quantum of rains or the monsoon strength in this article. B)below indiactes a description of the situation today (10th April). A)- Very very briefly, let us first understand, that the "power house" of our SWM is actually based far away in the southern Hemisphere. The main "generating factory" is the Mascarene Highs, SE of the Madagascar coast. The SWM is born down South, 4000 kms from the Indian Mainland ! The proper formation of these high regions,(1028 mb at least) will boost and create proper SE winds to lash the East African Coast near the Equator, and then turn SW in the Northern Hemisphere. B)-In this initial stage, we will observe the basic root and foundation,the initial parameters and the initial seed of the monsoon. 1. Cross Equtorial Winds should start forming, and taking shape from mid -April, especially in the South Indian ocean region. There are also signs of a Tropicsl cyclone forming in the S.Indian Ocean off the Australian Coast. 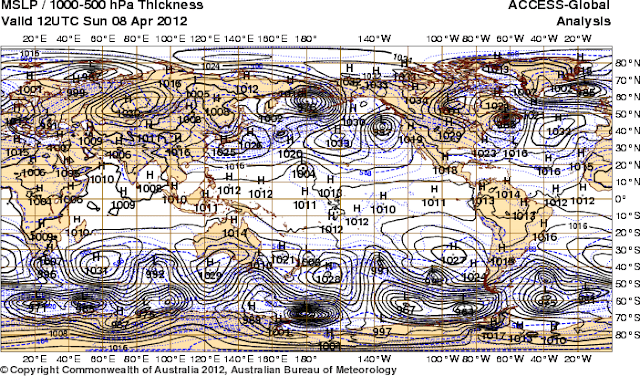 ITCZ today is around 7S. As the Monsoon strikes the Andaman Sea by mid May, developing wind currents are required to be observed near the Eastern side of the Indian Ocean, this is lacking as of today. 2. Now, this year, we have just about started the heating. The above normal heating in the NW has started from April, as March was relatively "cool" and below normal. Southern regions of the Sub-Continent have had some initial heating. This is not much of a plus point in the formation, or a quicker formation of one of the important pre monsoon weather requirment, the seasonal low. The seasonal low, stretch over Arabia thru India, normally starts forming in the Barmer and adjoining regions in the second week of April. Today, the MSL is around 1006 mb in the Sindh/Rajasthan region. In the "core seed"area, it 1004 mb. (The ultimate low in the core, in June when ready, should be 994mb.). Today, there is a "high" of 1006 mb covering almost the entire Indian region. This progress is fairly ok. The Seasonal Low normally is required to start taking shape for the monsoon by the second week of April. 3. La - Nina factor favouring SWM is over. It is now Neutral. Last SOI reading observed was +7. • The Oceanic Nino Index (ONI) is based on SST departures from average in the Niño 3.4 region, and is a principal measure for monitoring, assessing, and predicting ENSO. The readings for the last 2 warmer by 0.4c and warmer by 0.1c in the last week. Thus Neutral conditions prevail. 4. Another pre monsoon seasonal normal requirment is the creation of a low in the Bay by the second week of April. This is necassary to trigger off the flow and formation of lows from the bay. Summary for arrival Date: Parameter 1). normal, Parameter 2). -ve, Parameter 3). Normal. Parameter 4). -ve. Slightly tilted towards the negative , as of 10t April. New Readers, please note, These initial Parameters are normally (every year) considered in MW Series to guage and estimate the arrival date of SWM, not strength. Time of arrival normally indicated after mid-April, and strength after 24th April. "Bay is expected to produce a strong and sustainable LOW / Cyclone after 25-Apr and before 20-May-2012. !! " is this the one you are looking for which was supposed to have made it by 2nd week of april?? Nice write up, and will be useful reckoner for new readers who wish to follow monsoon. The content is really very knowledgeable.Thankyou for posting such a good blog. Ron:I do not see any low forming in the Bay till the 27th of April, at least. I shall put up my comment in the Indian weatherman (as a co-author). Ananth: Thanks, and yes, trip is good and enjoying Nature's beauty too. Shitij: Thanks, glad you found it useful. We shall follow the developments in the next article ..and i hope it is progressive and more positive for the SWM..
Mumbai is seeing some cloudy weather today. Powerful quake strikes Indonesia...and tremors felt in Mumbai too of 3.2 richter scale....were the tremors felt in Mumbai was due to the quake in Indonesia or was it a different quake caused due to Koyna dam near Satara...??? Thanks Rajesh for the detailed analysis. Reading your blogs throughout the monsoon season is awesome treat for the monsoon lovers :). Thanks once again. Thanks Rajesh. This is the best monsoon tutorial I have ever come across. You need to publish this in all newspapers - so that readers will understand essence of "monsoon" - origin of life. Meanwhile serious Karnataka drought is asking Maharashtra for help. Myself agree Maharashtra should give water to Karnataka on humanitarian basis. Maharashtra was always kind in history to share its Krishna/Godavari river waters. But Karnataka should reforms its bad ways - State which never promotes tree plantation-continuous cutting of trees, draining lakes till last drop and building properties on top of lake beds, continuous mining-setting fire to its western Ghats rain bearing region - how can nature be benevolent/kind? See the state of Bangalore it is barren and dry - still IT/Buildings/Vehicles are pumped in and to add this Karnataka corrupt government. People have abused Bangalore for money/property. Shri: seems likely that Mumbai felt tremor from the Indonesia Quake. But, reports are yet to come in..
Back here after long time.. Pleasantly surprised with your thundershowers prediction for Mumbai. Just saw that couple of weather sites expecting 6-8 ml of rain on friday. I know its difficult to predict exact rain amount when its comes to unseasonal thundershowers but will we get just sprinkle or more than that? Also read Monsoon Watch,after reading it for last 3 years I noticed that all those parameters slowly starts to turn positive from first week of may. Hoping that India gets good monsoon this year.